Letters are a great way to tell your friends about an important event or to congratulate someone close to you on a special occasion. It’s a much more thoughtful and personal way of communicating with your loved ones. There’s nothing like receiving a handwritten letter in the mailbox. Taking the time to write a letter and mailing it turns a simple message into a much more meaningful and personal experience. Using customized postage stamps is a great way to personalize your letters even further. A customized postage stamp may seem like a small detail, but often it is these details that can make all the difference. This is especially true when it comes to tiny things that people often overlook or simply consider too insignificant to care about. Customized holiday stamps are probably the most popular ones. However, you can order customized postage stamps for just about any special occasion you can think of, such as customized birthday stamps, baby shower invitation stamps, and many more. If you’re looking for a way to make your wedding invitation truly stand out, you can add a customized wedding postage stamp. Once you start looking for ideas of how to use these customized postage stamps, you’ll realize the possibilities are endless. You can also use customized postage stamps as a way of promoting your brand image. Using customized stamps on your business letters are easily going to make an otherwise uninteresting business envelope stand out. Your potential customers are surely going to appreciate the extra effort you put into making a good first impression. It’s a very simple way to maximize your brand’s visibility. You already need to use postage stamps to mail business letters, so why not use that space to its full potential? What better way of showing your partners and customers that your business is genuinely concerned about finer details? Finding the right company that can provide you with the customized postage stamps services you need can be a bit tricky, as there are many options to choose from. Make sure the company you choose is authorized by USPS. We have made a list of customized postage stamp providers to make your search easier. Whether you are interested in purchasing customized postage stamps for your business, or you want to send out unique invitations and cards, these service providers are sure to have something for everyone. If you are looking for a complete rundown of all the online services that allow you to make customized stamps online and print them at home, check out our page on how to print stamps online. Stamps.com are truly the experts when it comes to postage stamps – you can check out our review of stamps.com here. They also offer customized postage stamps options, for those who want to mark a special occasion or businesses that want to stand out. You can visit the customized postage stamps page, photos.stamps.com to view their stamps design gallery and learn more about how to get customized postage stamps. 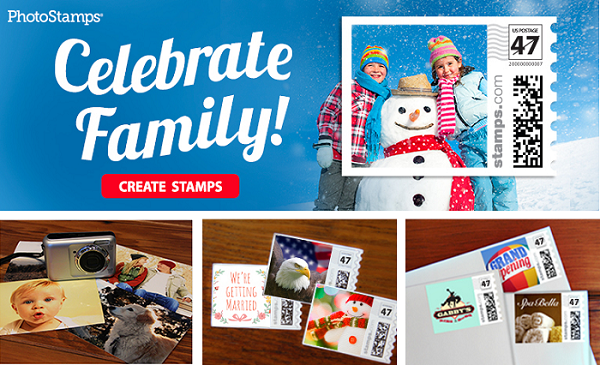 Shutterfly.com offers many options for personalized postage stamps and more. They have a lot of templates to choose from, as well as options to change those templates according to your needs. You can also include your own designs. Tinyprints.com is a great website for those of you who want to find inspiration for their custom postage stamps. They have a lot of options when it comes to premade designs and customization alternatives. You can use their designs and options as a basis for your own custom postage stamps. Evermine.com offers many options when it comes to customizable items so, naturally, they also have postage stamps. They provide templates you can tailor to your needs and preference. You can also send them a photo or your own design to fit on a stamp. PictureItPostage.com is ideal for anyone who has a very clear idea of what they want their customized postage stamp to look like. All you need to do is upload the image or text you want on the stamp and they will automatically add the USPS barcode and create the stamp for you. How Much is a Roll of Stamps?